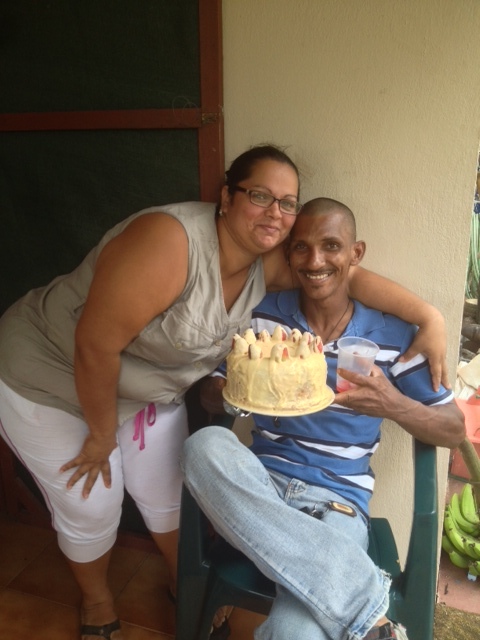 Last Friday was Cuco’s (Maricela’s espouso) Feliz Cumpleanos and we were invited to help him celebrate on Sunday afternoon. Maricela makes the best tasting Picadilla de Papa!!! Had rice, beans and chicken also. After eating, the music started….and I’ll give you three guesses who the main entertainment was! Yep, you guessed it Nazareth! Met a friend of their family named Orlando. He does sculpting out of any type of material; he’s made sculptures for Mel Gibson’s mansion in Costa Rica, of which I promptly said, “tell good ole Mel to pay his taxes he owes to Costa Rica”! (It went over everyone’s head!) He learned how to do this type of work in Mexico. He’s been all over the world doing various things. For those from Atenas, as you enter town via Hwy. 3 and look at the sculpture high on the mountain, that’s just one of his works. He has an ipad and showed us many, many photos of various works he’s completed. He is absolutely amazing! And Maricela is going to take Mark and I to his house. There’s an animal park in Guanacaste and he has some of his work on the grounds there. We left when the rain came in. It was an entertaining afternoon!! !